The Iraqi invasion of Kuwait in August 1990 constituted the first post-Cold War crisis. 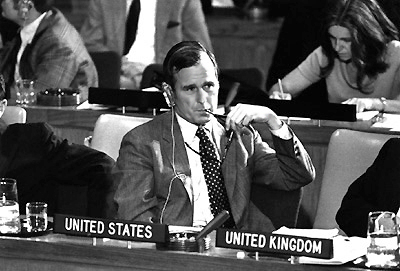 The great powers could have handled it any number of ways – in NATO, with a "coalition of the willing," or with a new organization – but Bush (himself a former U.S. ambassador to the UN) took the matter to the Security Council for decision making. I opposed this decision at the time, seeing it as investing unwonted authority that would long outlast the Kuwait crisis in a morally decadent and politically hostile institution. Indeed, Bush's action had this effect – and we live with the rueful consequences today. UNSC votes on Iraq, Libya, and Syria have had a major impact, permitting a semi-despotism in Moscow and a full-scale one in Peking to exert a major influence on the decisions of democratic states. (1) A bipartisan folly: a Democrat founded the organization and a Republican turned it into today's powerhouse. (3) Another Bush: George W. Bush built on his father's mistake by begging the UNSC for resolution after resolution on the Iraq issue.